Trumpeter Jay Phelps is at the forefront of the young and creative generation of jazz musicians in the UK, with an instantly recognizable warm and projecting tone. A Vancouver-born Canadian, Jay was tutored by the city’s top jazz and classical trumpeters and distinguished himself early on as the youngest band-leader in the Vancouver International Jazz Festival's history. At 17, Jay moved to London, determined to immerse himself in the jazz scene and immediately attracted the notice of Gary Crosby who offered him work with Jazz Jamaica, Nu Troop and, in 2002, the opportunity to be a Tomorrow’s Warrior. Citing Louis Armstrong, Fats Navarro, Clifford Brown and Miles Davis as his main influences, Jay went on to create and co-lead the young and hip jazz sensation Empirical, where he spent two years touring major festivals and events, while garnishing worldwide media attention that UK jazz musicians haven't enjoyed for years. 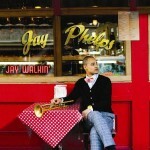 Jay has performed and recorded with a veritable who's who of both UK and international jazz artists such as Courtney Pine, Andrew Hill, Wynton Marsalis, Ray Brown, John Hendricks, Nasheet Waits, George Benson, Jamie Cullum, Sir John Dankworth, Dennis Rollins, Guy Barker, Amy Winehouse, Charlotte Church, Hugh Masakela and Jazz Jamaica. Now just touched his thirties, Jay is determined to educate the next generation of jazz musicians with a local project entitled Jazz Youth. In Jay Walkin' - his solo-debut - Jay departs from the current trend of experimental modernism, occasionally evoking the spirit of the 1940's New York Birdland scene with playful vocals by showman-vocalist Michael Mwenso. Set out to honour the integrity and capture what is the traditional spirit of Jazz music, Phelps has composed and arranged songs with this in his vision. Phelps has chosen a stellar line-up consisting of a generational mix of London’s top Jazz musicians. Jay Walkin', recorded on Proper's Specific Label, was released in November 2010.